Hot, Hot, Hot! Treat guests to one of the hottest wedding trends right now… our sensational Wedding Fire Pit Tables are available to hire for just £150! Our two Wedding Fire Pit Tables look amazing in the stone flagged courtyard in-between our beautiful stone barns. They really add to the ambience of your evening reception. 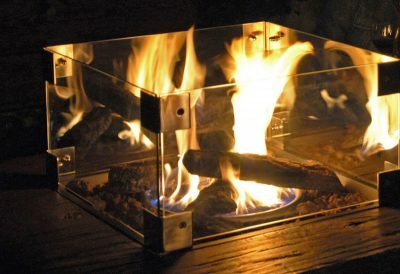 Guests can enjoy a drink, stood around the bar-height tables, warmed by the glowing fire. Turn Up The Heat at Your Wedding! We want you and your guests to enjoy the Best Day Ever at The Ashes Barns and we’re always on the lookout for new and exciting ways to enhance your wedding day experience. Our two Wedding Fire Pit Tables really suit the venue and look fabulous when they’re lit. When not in use, the fire pit in the centre of the table is covered and the tables remain in position for your guests to use as a traditional bar-height outdoor table. They look great like this too! Don’t hesitate to talk to your Event Manager about how to make the most of them on your wedding day. Please let your Event Manager know if you’d like to make use of the Wedding Fire Pit Tables at your wedding and we’ll add the £150 hire fee to your account. Hire of our rustic Wedding Fire Pit Tables is entirely optional. You might also like our sensational Light Up Letters, available to hire for your Ashes Barns wedding. Click the button for details.